I would have to say that some of my favorite summertime memories involve sitting on the porch. Snapping beans and shucking corn with my grandmother. Swinging on the old porch swing with my grandfather. Playing board games on the screened porch at the beach with my cousins. Playing paper dolls with my sister. Laughing. Talking. Crying. Sharing. Summer. Porches. Family. What could be better. 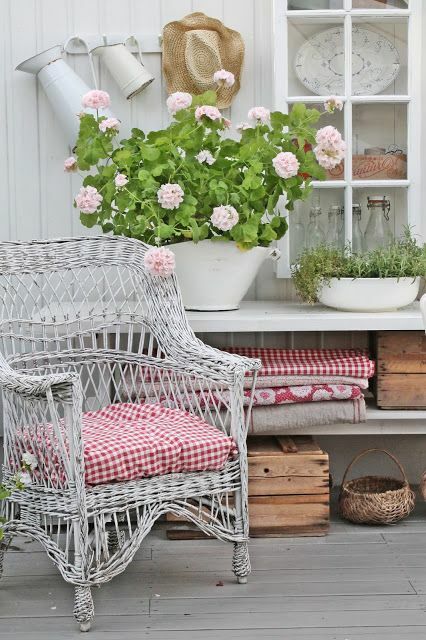 In the south porches are an integral part of life. It doesn't matter if the porch is big or small, it is the place to conduct business. 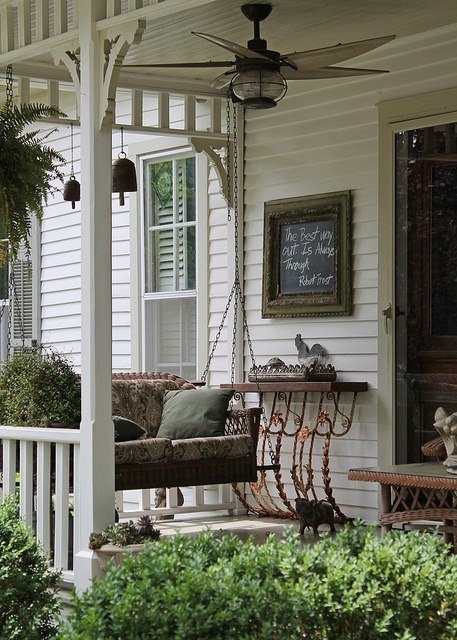 In days gone by, before air conditioning, it was a place to escape the heat of summer, to read the morning newspaper, to sit and sew, to greet neighbors and share a glass of sweet tea, to kiss a sweetheart goodnight. People didn't have to form neighborhood watch groups back in the day. Neighbors sitting on their porches knew what was going on and they monitored it. They knew where the children were. They knew if the teenagers were misbehaving. They knew if there was happiness or sadness in their neighbor's family. They knew a sense of community. Summer is here. Maybe it's time to bring back those old porch traditions. Come out of our air conditioned houses. Turn off the TVs. Sit and smell the roses. Talk to our neighbors. Spend time with our families. Enjoy the moment. Thanks, Susan. It is always nice to visit you. I think people have gotten so acclimated to a/c that they don't want to be out anymore. Unfortunately it has contributed to people's isolation. I do wish I had a front porch. I grew up with them and miss them so much! 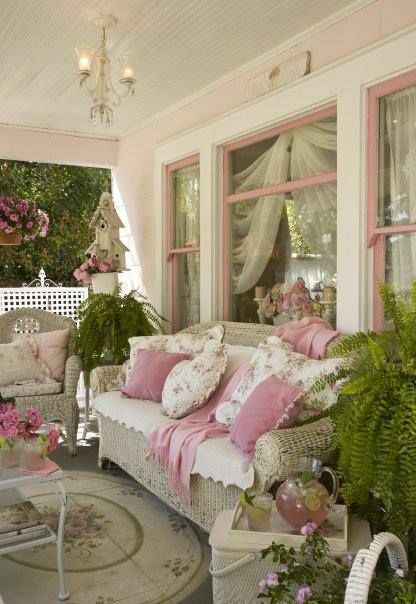 I used to love sitting on the porch with my husband in the summertime. I really miss that! That memory with my grandmother is a wonderful one. 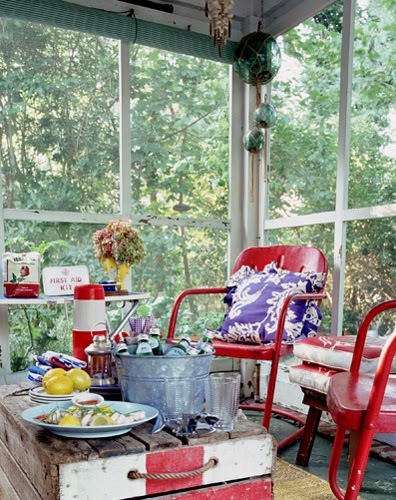 I love a deep porch or a screened porch, too for the same reason, Susie. The first one is my favorite because my granny had chairs like those only yellow. She had a swing too and there was ivy that grew behind the swing to keep us all cool. I never remember feeling the heat as a child. I guess we were having too much fun. Yes, when my great grandmother died there were 96 children, in laws, grandchildren, great grandchildren and great grandchildren listed. Of course this included husbands and wives, but there was always cousins to play with. Families were larger then and it felt like community. Now my family and children rarely see each other. So sad. Love this post. Thank you, and thank you for sharing your wonderful memories of your family. Families are so scattered now. I think children miss a lot because of it. We walk outside in the evenings to watch the sunset and chat with neighbors. A lot of people walk in the evenings in our community so it's a good time to say hello. It's nice to get outside....but you would need a screened in porch here in Florida. Enjoy your week my friend! Sweet hugs! I agree that we need to enjoy our moments more. I love that first porch picture. I love that one too, Michelle. So true Laura we need to get back to basics sometimes. What a great post. Happy 4th I hope you get some time to sit out on the porch! Thanks, Kris. Happy fourth to you, too, and I hope you get some porch sitting time, too. I too am a child of the porch. My great aunt had the best--a swing that my cousin and I would play "catch the school bus" on. She'd swing high, and I'd see if I could jump on. Otherwise, I'd miss school. I regularly get my dose of what I know refer to as porch "therapy." Thanks for this beautiful post!